Sometimes it just takes a little thing to make a big impact on a product. Devolo has been making quality powerline network adaptors for some time, such as the Devolo dLAN 500 AVtriple+, and the Devolo dLAN 500 AV Wireless+ is the pinnacle of Devolo's premium line of adaptors. In this starter kit there are two adaptors that come with mains pass through sockets, which means you don't lose a power socket when you plug in the adaptor. It's a welcome touch, and also helps clean out any interference from other electrical devices that are plugged in to the pass through socket, which can help improve data speeds. The second adaptor includes three LAN ports, enabling wired connections, along with built-in Wi-Fi that turns the adaptor into a wireless hotspot. This method of expanding your wireless network works better than a wireless booster due to the fact that it doesn't have to rely on a weakening existing Wi-Fi signal to boost - it creates a brand new network straight from the powerline, resulting in excellent Wi-Fi coverage. It supports both 2.4 and 5GHz bands, though not at the same time. But what about that "little thing" we mentioned? We're talking about the slight alteration that makes the long body of the adaptors direct upwards above the power socket, rather than hanging down as with older models. This small change not only makes the LAN sockets easier to access, but also makes the adaptor easier to install, especially for those of us that have power sockets close to the floor. Overall this is a fantastic product, with excellent data transfer speeds and the dLAN Cockpit app provides the ability to monitor and configure the network from your mobile device. 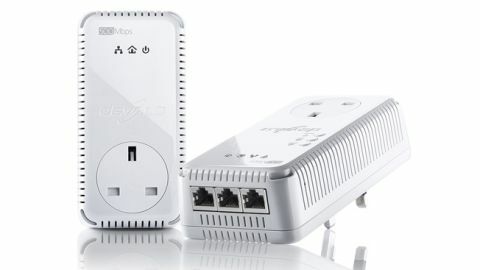 Devolo has once again made a brilliant powerline networking adaptor that's both future-proof and backwards compatible if you have older powerline devices.